The history of war and the history of mankind are inseparable. The battles listed above are turning points not just in the wars of which they are a part, but also in the course of human events. I’d like to tell you about another such pivotal battle. One you probably haven’t heard of. I’d like to tell you about... Ethandun. Danes (Vikings) had been attacking the British Isles for many years. One by one the individual kingdoms that would one day be united under the same flag fell to Danish control; Northumbria, East Anglia, Mercia. By 877 only the kingdom of Wessex resisted the invaders. 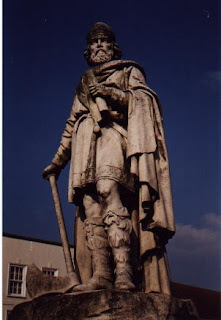 The Viking king, Guthrum, had sworn on oath of peace the year before, but in a surprise attack that winter drove the king of Wessex, Alfred, from his throne. The other Saxon nobles and kings had fled overseas, and Guthrum assumed that Alfred would follow the same course. Alfred however, was not like other nobles. He was not about to give up his kingdom so easily. He went into hiding on the Isle of Athelney in Somerset until the spring of 878. At that point he sent out messengers, summoning the Anglo-Saxons to a place known as Egbert's Stone. The thanes responded, rejoicing to learn that their king had not abandoned them. The army then spent a night at Iley Oak, deep in wooded country, a spot now called Robin Hood's Bower. (Sorry! I haven't the foggiest idea why it's named after Robin Hood, though the name certainly has some implications). According to the Anglo-Saxon Chronicle about 4,000 men marched from Egbert’s stone. Only a small minority of the army would have been professional soldiers. The majority would have been made up of land owners, those that owed money to the land owners, and those who rented land from the land owners. Guthum found out about the approaching force, and mobilized his army to meet them. When Alfred found the Viking army, it was occupying the high ground at Ethandun (Edington). Alfred would have approached from the south east across Salisbury Plain. What Alfred’s troops lacked in experience they made up in numbers. Guthrum and his professional soldiers were driven off the field of battle. He fled to his fortress at Reading. A few days later he surrendered. Alfred had sufficient arms and men to destroy his enemy once and for all. Guthrum was baptized with the name Aethelstan and spent the next twelve days being taught by Alfred what it meant to be a Christian. His catechism completed he was allowed to return home with the remainder of his men. Except for one brief (and unsuccessful) raid prompted by Danish nobles back home, Guthrum kept the new peace. Alfred himself became the only English king called "Great." In order to ensure the security of his expanding kingdom, he built a navy featuring a new ship design, created a system of forts allowing a permanent standing army while protecting the populace at home, brought the previously mentioned kingdoms and W ales under Saxon authority, and revised a number of laws, building on Biblical teachings. Alfred the Great is sometimes called the "father of the English language." Constant war had disrupted learning in England. Alfred reformed learning among his subjects by changing from Latin to the early English language. Scholars were in such short supply so he imported them. He himself spearheaded the drive to translate psalms, Gregory's Pastoral Care, Orosius' Geography, Boethius' Consolation of Philosophy, and several other works into the language of England. The Battle of Ethandun, which turned the tide of history preserving Christianity and promoting its values as part of Alfred’s sweeping reforms happened on May 6, 878 — 1,129 years ago this week. May 7, 1274 - The Second Council of Lyons convenes with the goal of reunifying the Roman and Greek churches. Orthodox delegates agreed to recognize the papal claims and recite the Creed with the"from the son" clause added, but the union was fiercely rejected by the majority of Orthodox clergy and laity fiercely rejected the union. May 8, 1559 - The Act of Uniformity receives Queen Elizabeth I's royal assent, reinstating the forms of worship Henry VIII had ordered and mandating the use of the Book of Common Prayer (1552). May 9, 1983 - Pope John Paul II reverses the Catholic Church's 1633 condemnation of Galileo Galilei's Copernican heliocentric (sun-centered) theory of the universe. May 10, 1310 - In Paris, 54 Knights Templar are burned alive. The catholic church created the Templars to protect Holy Land pilgrims from bandits, but the knights' quick rise in power and wealth made them unpopular. Philip the Fair (?) of France trumped up charges of blasphemy and homosexuality against them to convince Pope Clement to disband the order and persecute its members. May 11, 1610 - Death of Jesuit missionary Matteo Ricci, the first Catholic missionary to China. Entering the country as a clockmaker, Ricci was criticized for embracing the teachings of Confucius scholar and allowing ancestor "worship." Ricci did not gain many converts but among the few were a number of influential Chinese families. May 12, 1792 - Father of Modern Missions William Carey publishes his highly influential book on the importance of evangelism. Carey was a innovative missionary but could have used an assist on the title of the book - " An Enquiry into the Obligations of Christians, to use means for the Conversion of the Heathens in which the Religious State of the Different Nations of the World, the Success of Former Undertakings, and the practicability of Further Undertakings, are Considered." Save your Enemy - Get Burned.